I would say that my side project is facilitating the design and tech community in the Hudson Valley and Upstate New York. This takes on a few different forms and takes a little juggling. For the last two years, I have been a Co-Organizer of the Hudson Valley Tech Meetup. We are a organization of over 2,500 members that operates out of a meetup.com page. We strive to connect the people in our region doing cool work related to technology. It’s really focused on bringing people together to share the things they are passionate about. Speakers range from students sharing their thesis projects at local colleges, to founders of nationally recognized tech companies sharing what it was like to get to where they are. These gatherings are not just about seeing people talk, though. It’s where the tech community in the Hudson Valley comes together. It’s how a professionals in the area can form a network and see how many people nearby share their interests. 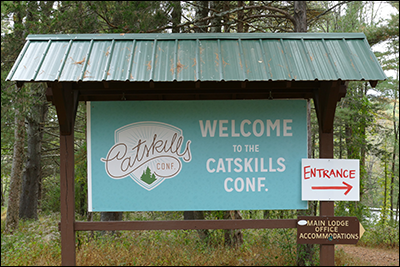 Also in this time, I have helped organize Catskills Conf, which happens in the Hudson Valley every October. This year will be my third time on the organizing team, and the fourth time the conference has run. I attended as a volunteer at the first event as a college student and fell totally in love with it. This is not your average conference. It has the talks about design, development and entrepreneurship that you would expect, but we also have activities like blacksmithing, letterpress and foraging. It’s unique because you get the opportunity to network with great people, but you also get to stay in a cabin with everyone and toast marshmallows around the fire every night. You get the opportunity to get to know people, and skip over the stress that would normally come with attending a conference. The second year, I led the volunteer team and did all the design work for the event. Last year, I tried my hand at emceeing and taking over more responsibility, and am continuing with that this year. 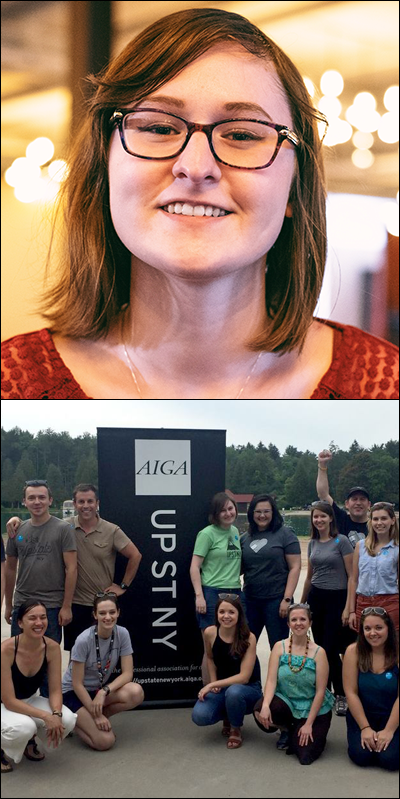 As of a month ago, I am the Co-President of AIGA Upstate New York. AIGA is a national organization with 72+ chapters all over the country. We are the professional association of design, doing work to advance design and designers all over the country. Our chapter focuses on all of New York State that is not New York City or Long Island. I lead a remote team of over 20 people, all of who live in our state. We run events in the Hudson Valley, Capital Region, Ithaca, Syracuse, Binghamton, Rochester, Glens Falls and Buffalo. What drew me to AIGA and why I have stepped up to lead the organization for the next 2 years, is the people in our chapter. Upstate New York has a truly special design community. Through our events and Slack community, we are connecting employers to local talent, helping emerging designers get started, and making it possible for all of us to build a local network we can collaborate with. Through being involved, I have made friends who also work in the design field all over the state that I would have never met otherwise. Prior to becoming Co-President, I served as Programming Director for a year. This meant I was leading our team of programming coordinators—the people on the ground in all the locations listed above—and helping them run design-focused events. These include our monthly coffee and cocktails meetups, our annual Design Crawl (think bar crawl, but design talks and studio visits mixed in! ), and our emerging designers’ portfolio reviews. Since I am in the Hudson Valley myself, I also help run our local events, and go to them. I also periodically speak at conferences, mostly on the topic of inclusive design. Most recently, I traveled to Charlottesville, Virginia, to participate in a panel about the topic, as well as to be a keynote speaker at a diversity-focused hackathon, hacking.digital. I think it is important to share my research and hear other people’s perspectives on this topic. I would not be able to do any of this without the complete support of my partner, my friends and co-workers. Many people try really hard to keep their career and their personal life completely separate, and while there definitely isn’t anything wrong with that, (everyone has a right to lead their life in the way they want!) that approach just isn’t how my life has gone. The people I spend my free time with are also the people I get to work alongside, which can be a really special thing. Knowing the people you work with can result in much more meaningful work, and better understanding of one another overall. A lot of the time, I will stay at my desk for an extra hour or two after my work day is complete, sending emails to speakers for the Catskills Conf or chatting with our board members for AIGA, making sure they have the resources they need to be successful. Occasionally, a weekend will get sacrificed here or there. It’s not the easiest thing, but my take on it is if you want something to exist, you can’t wait around for it to happen. I care a lot about the place where I live—and I want it to be somewhere that people can feel like they can be successful in their careers. I really believe I live in one of the most beautiful and kind places in the world, and I want more people to have the opportunity to do meaningful work here. I’ll also say, none of this would be possible if I were trying to do it alone. All three of these organizations that have members, sponsors and organizing teams that make it all happen! Working on something you are passionate about and getting a lot of creative freedom with can make such a big difference. It is a great opportunity for personal growth. I learn new things all the time that I would never learn at work that are really beneficial to me in the long run. I am developing the leadership skills I’ll need someday when I’m a Creative Director, as well as just learning the ins and outs of how organizations really work. A side project can be such a great opportunity to find your people. This is especially true to folks who might not be at their dream job, or who just aren’t finding their day-to-day very fulfilling. This is how you can get to do exactly what you want, and even open up important doors for yourself later by building the right network. Also, it’s just really great to do what you want! A lot of what I do is collaborative and team-based, but lots of people do their side project on their own or in a smaller group. While critique and constructive criticism are crucial to our design processes, it can be really empowering to just make something because you want to and don’t have to go back and change it for someone else. Diptych and photo of the Catskills Conf courtesy of Shauna Keating—portrait by Jen Thomas.